Spanish astronaut Duque on the ISS, October 2003. 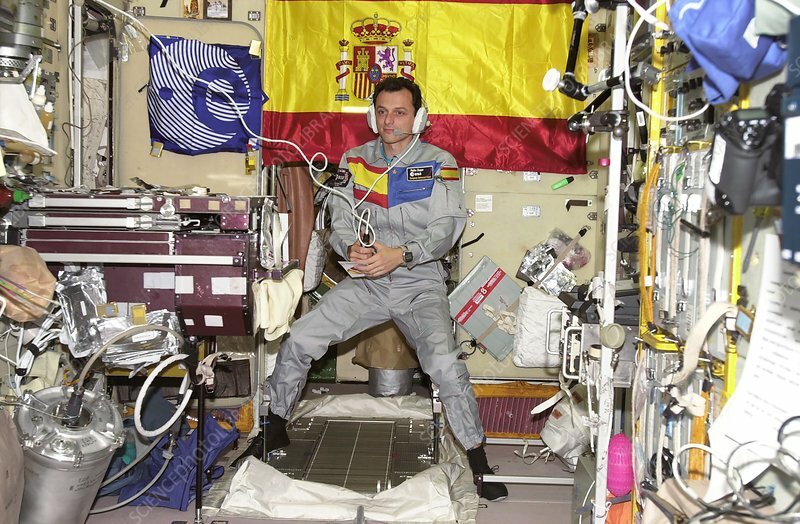 European Space Agency (ESA) astronaut Pedro Duque (born 1963) of Spain using a communication system in the Zvezda Service Module on the International Space Station (ISS). Duque was visiting the ISS for several days in what was named 'Mission Cervantes'. Duque launched on Soyuz TMA-3 (18 October 2003) and returned to Eartyh on Soyuz TMA-2 (landing 28 October 2003). Duque had previously flown in space on the Space Shuttle Discovery on mission STS-95 in 1998. After these two space flights, Duque worked in satellite imaging and with the ESA astronaut corps. In 2018, he was appointed Spain's Minister of Science, Innovation and Universities.